F-16XL2 EC96-43548-10: F-16XL Ship #2 SLFC - in flight configured with SLFC "glove"
Description: During an April 18, 1996, flight research mission, NASA Dryden Flight Research Center's modified F-16XL conducts testing on laminar flow. 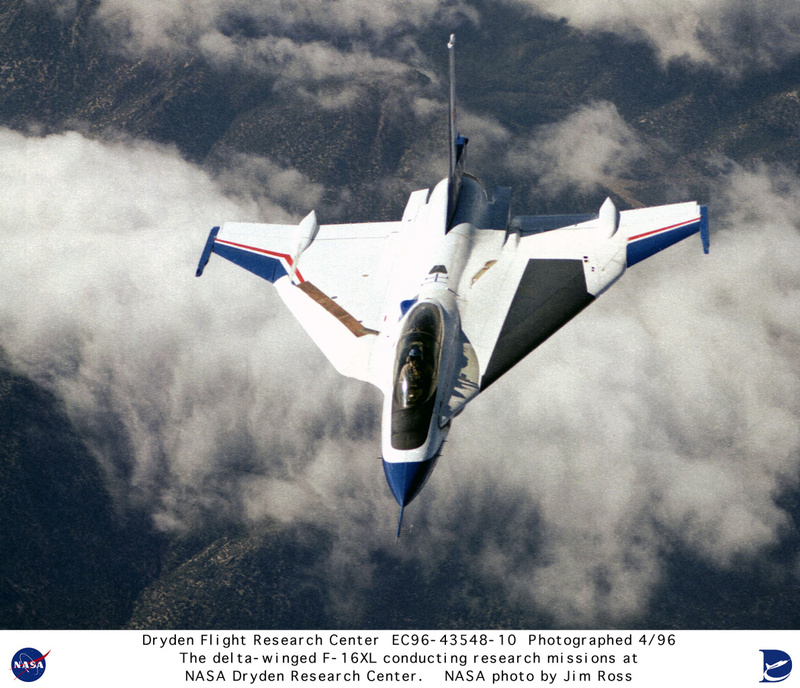 The research being conducted involves a delta-winged F-16XL modified with a "glove" which is made of titanium. The glove contains more than 10 million holes and has a suction system attached to the lower surface which is comprised of tubes, valves and a compressor. During research flight the suction systems pulls a small part of the boundary layer of air through the glove's porous surface to create laminar (or smooth) air flow.